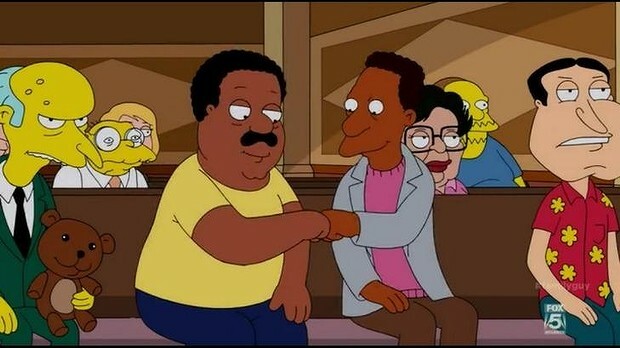 I suppose I might as well take a look at the Simpsons/Family Guy crossover, since I do still watch both shows. It was pretty heavily built up for something that probably would have gone over much better years ago. It seems like the general feeling now is that both shows are now past their prime, but I haven’t exactly surveyed a random sample of people to get this idea. Of course, both shows have referenced the other on occasion, but I don’t think either had done a full-fledged crossover in some time. It pointed out the similarities and differences, calling attention to such things as how FG often goes for jokes that are edgier but not necessarily funnier. The Simpsons was originally seen as pushing the envelope somewhat, but now often comes across as pretty tame. When I first saw FG, I found it to be a quite similar show, but less grounded in reality. From the very beginning, it had a talking dog, a baby who invents science fiction gadgets, and commercial mascots showing up in real life being a relatively common occurrence. On the other hand, the characters never seemed to have quite as much personality, and only occasionally did they give the impression you were supposed to care all that much about them. I felt that there wasn’t enough of a reaction from the Simpsons to the dog talking, because that’s just not something that would normally happen in their universe. Most of the interactions worked pretty well, although some seemed a bit forced. 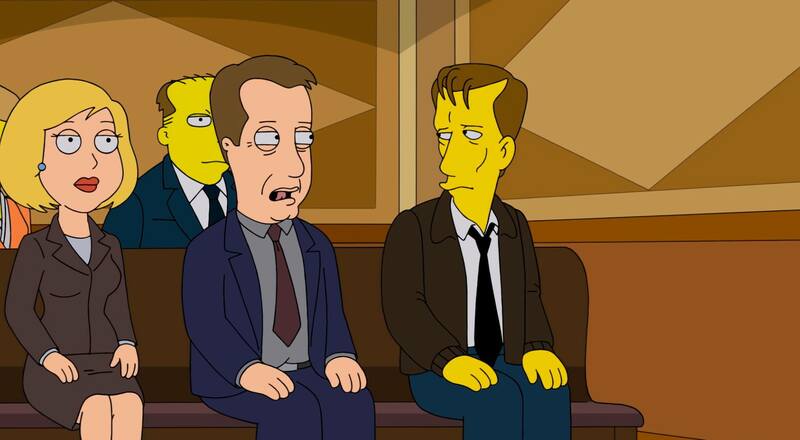 I did like the courtroom scene pointing out the similarities between characters, including James Woods as he appeared on both shows. Fred Flintstone as the judge drove home how much all prime-time cartoon sitcoms owe to The Flintstones. I wasn’t so keen on the overly long fight scene, which FG overdoes anyway, but it had its moments. Roger from American Dad! showing up with Kang and Kodos was cool, and of course there was the obligatory reference to Homer falling down Springfield Gorge. Mind you, jokes going on way too long is pretty much a FG trademark, although Simpsons did it a few times first, like Sideshow Bob stepping on the rakes. Sometimes it gets funny again because of how ridiculously drawn-out it is, but other times it’s just boring, and I’m not really sure what the key factor is that makes the difference. I actually thought the proper Simpsons season premiere was, at least in some ways, more interesting. I saw the first few minutes while getting ready to drive back home, so I knew what it was about, and it wasn’t until after this that I read the description. It just says that a character dies, and I have to wonder if they promoted this one like they did for other character death episodes. When Maude Flanders died, there were commercials trying to play it off as a mystery who would die, but it had already been leaked on the Internet that it was Maude. Recently, they did another episode with a promoted character death, and then it turned out to be a character who’d never appeared before. Killing off Rabbi Krustofsky makes a certain amount of sense, as he’s not that significant to the show, but was important enough that audiences would care. Maybe they wanted to make sure to give the character a proper send-off while Jackie Mason was still around, as he’s now eighty-three. The Rodney Dangerfield appearance made me wish they’d thought to use Larry Burns at least once more. It does seem like practically every Krusty episode has him temporarily leaving show business, but that’s true for other characters as well. How many episodes can be summed up with, “A supporting character loses his or her job, and the Simpsons help them get back on their feet”? Stick with what works, I guess. The subplot with Lisa worrying about Homer was a bit tacked on, but not badly done. By the way, we learn that Krusty’s mother was named Rachel and died when he was young, but was she also Luke Perry’s mom? This entry was posted in American Dad, Cartoons, Family Guy, Humor, Television, The Flintstones, The Simpsons and tagged brian griffin, crossover, fred flintstone, homer simpson, jackie mason, james woods, kang and kodos, krusty the clown, lisa simpson, maude flanders, rabbi hyman krustofsky, rodney dangerfield, roger, sideshow bob, stewie griffin. Bookmark the permalink.